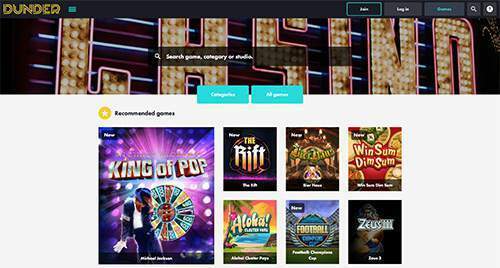 Dunder Casino is a trendy online casino with well over 600 different games from multiple leading platforms including Microgaming, Play’n GO, NetEnt, Quick Spin, NextGen Gaming and Betsoft, along with live dealer games from Evolution Gaming. Many of these titles are both mobile and home accessible for players. The casino fresh out of the box and established in 2016 with a modern interface and provides easy access to all parts of the website. Dunder is covered by the legislation of the United Kingdom and Malta. It is evident that Dunder was set up by two casino players, first proof of this is the welcome bonus. We are pretty stoked about and we are sure you will be too. So head over to Dunder and open your account! Registering only (so no deposit!) gives you 20 free spins on Star Burst. Your first deposit is 300% bonus up to €50 and 20 free spins on Star Burst for 9 days (25 euro deposit means 75 euro play money). Your second deposit is 50% bonus up to €150 (300 euro deposit means 450 euro play money). If any casino would offer this kind of bonuses than you would keep playing, but this is quite an exception so make use of it by opening an account and making your deposit! Members can enjoy a plethora of video slots released by some of the largest providers in the industry, including NetEnt, Play’n GO, Microgaming, and much more. These are some of the most graphically advanced and detailed games available on the market. Players can also play on the big progressive jackpot cabinets such as Mega Moolah and Mega Fortune. In addition to the collection of slots, there is also a wide range of table games and other casino favorites. Blackjack and Roulette offer is very diverse with both classic and modern variations of these very popular games. Dunder also features several table poker games such as Cyberstud Poker, Casino Hold’em and Pai Gow Poker, plus baccarat and other popular games. Dunder has seven different video poker games. These are All-American Poker, Deuces Wild, Double Bonus Poker, Double Joker, Joker Wild and Tens or Better. Different scratch card games and other special games are also offered. Players can also enjoy top-tier live dealer games from the experts at Evolution Gaming. All these games are real-time broadcast using advanced webcam technology. This unique part of the site currently offers 24/7 numerous variants of the Live Blackjack, Live Baccarat, Live Roulette and Live Casino Hold’em. Mobile players can easily access their favorite games at Dunder. The mobile interface of the site makes it easy to play instantly via almost any smartphone or tablet without having to download anything. With handy filters you will easily find the game you want. Dunder has a support department that is available 7 days a week between 10:00 am and 10:00 in the evening. The quickest way to get in contact is via live chat service. Players can also reach the casino by email and in most cases you have an answer within a day. Dunder uses SSL encryption on every page of the website. This technology prevents attackers from intercepting sensitive information. All games at Dunder Casino are regularly checked for fair play. These checks comply with the strict mathematical standards of the UKGC. This gives you as a player the guarantee that the games at Dunder are 100% honest. Afghanistan, Algeria, Angola, Anguilla, Antigua & Barbuda, Argentina, Aruba, Australia, Armenia, Azerbaijan, Bahamas, Barbados, Belgium, Belize, Benin, Bermuda, Bhutan, Bonaire (Sint Eustatius and Saba), Botswana, Bouvet Island, Brazil, British Indian Ocean Territory, Bulgaria, Burkina Faso, Burundi, Cambodia, Cameroon, Cape Verde, Cayman Islands, Central African Republic, Chad, China, Christmas Island, Cocos (Keeling) Islands, Comoros, Congo (Democratic Republic of), Cook Islands, Costa Rica, Cote d’Ivoire, Cuba, Curacao, Cyprus, Czech Republic, Denmark, Djibouti, Dominica, Dominican Republic, Ecuador, Egypt, El Salvador, Equatorial Guinea, Eritrea, Estonia, Ethiopia, Fiji, France, French Guiana, French Polynesia, French Southern Territories, Gabon, Gambia, Ghana, Greece, Greenland, Grenada, Greece, Guadeloupe, Guatemala, Guinea, Guinea-Bissau, Guyana, Haiti, Heard Island, Holy See (Vatican City State), Honduras, Hong Kong, Hungary, India, Indonesia, Iran (Islamic Republic of), Iraq, Ireland (sports betting prohibited), Israel, Italy, Jamaica, Jordan, Kazakhstan, Democratic People’s Republic of Korea, Kuwait, Kyrgyzstan, Lao People’s Democratic Republic, Lesotho, Liberia, Libya, Madagascar, Malawi, Malaysia, Maldives, Mali, Martinique, Mauritania, Mauritius, Mayotte, Micronesia, Montenegro, Montserrat, Morocco, Mozambique, Myanmar, Namibia, Nauru, Nepal, New Caledonia, Nicaragua, Niger, Nigeria, Niue, Norfolk Island, Oman, Pakistan, Palau, State of Palestine, Panama, Papua New Guinea, Philippines, Pitcairn, Poland, Portugal, Réunion, Romania, Rwanda, Saint Barthélemy, Saint Helena (Ascension and Tristan da Cunha), Saint Kitts & Nevis, Saint Lucia, Saint Martin (French part), Saint Pierre and Miquelon, Saint Vincent and the Grenadines, Samoa, Sao Tome and Principe, Senegal, Seychelles, Sierra Leone, Singapore, Sint Maarten, Slovakia, Slovenia, Solomon Islands, Somalia, South Africa, South Georgia and the South Sandwich Islands, South Sudan, Spain, Sudan, Suriname, Svalbard and Jan Mayen, Swaziland, Syria, Tajikistan, Tanzania (United Republic of), The Faroe Islands, Timor-Leste, Togo, Tokelau, Tonga, Trinidad and Tobago, Tunisia, Turkey, Turkmenistan, Turks and Caicos, Tuvalu, Uganda, United States, United States Minor Outlying Islands, Uruguay, Uzbekistan, Vanuatu, Virgin Islands (British), Wallis and Futuna, Western Sahara, Yemen, Zambia, Zimbabwe. Dunder casino carries our reward of excellence seal that is only awarded to online casinos that meet our standards with an average of 8/10 or higher. With this seal we also state that Dunder is a fully trustworthy casino with a good service for its players. Great casino with a lot of games and the bonus is good too. I deposited 40 euros and got another 40 euro bonus and free spins. I like this casino and the games I just signed up deposited 20 lost it then deposited another 20 with 200% bonus and and then I won after playing the long wager so im happy with that.